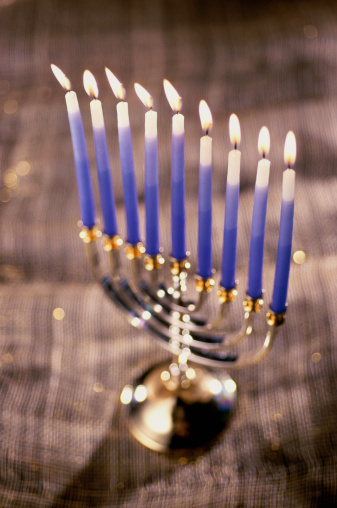 Chanukah begins the evening of Tuesday, December 12. There are parties, public menorah lightings, and fun events across the city all week long! Here are a few highlights, and of course, don’t miss the Center City Kehillah’s own candle lighting on Monday, December 18 at 5:30 pm in Rittenhouse Square. Tuesday, 12/12 (1st candle) – Join Jewish Federation for a menorah lighting on Boathouse Row! 6:00-7:00 pm at Fairmount Dam and Schuylkill River Trail. Contact dengelmyer@jewishphilly.org for details. Wednesday, 12/13 (2nd candle) – Temple Beth Zion-Beth Israel’s “Festival of Light” party will begin with a deLIGHTful performance by ArcheDream for Humankind, a blacklight dance and theater company. The performance will be followed by a big community celebration with fried food, music, candle lighting and more. This event is open to the whole community. Click here for details and to register. 5:45 pm at 300 S. 18th St.
Thursday, 12/14 (3rd candle) – Young Friends of NMAJH present: Cocktails and Candle Lighting, 7:00-10:00 pm at the museum at 5th and Market. Click here for all the details. Friday, 12/15 (4th candle) – Join Makom Community for a family Shabbat celebration with a Chanukah theme. All are welcome at 5:30 pm at 2000 Chestnut St. (entrance on 20th), 2nd floor. Click here for more information or to get in touch. Saturday, 12/16 (5th candle) – Chevra and Tribe 12 team up for One Crazy Night, the premier Chanukah party + concert for 20s & 30s. Open bar & cocktails, festive doughnuts & chocolate gelt, and candle lighting. 9:00 pm-2:00 am, 2002 Ludlow Street. Click here for details. Sunday, 12/17 (6th candle) – Moishe House Philadelphia and Repair the World Philadelphia team up for Story Slam: A Light in the Dark. You’re invited to A Moth style story slam for the Philly Jewish Young Professionals community. The theme is A Light in the Dark. 4029 Market St, 6:00 pm. Click here for more. Monday, 12/18 (7th candle) – Join the Center City Kehillah and its 30 participating organizations for our annual candle lighting in Rittenhouse Square. We’ll have music, treats, a raffle, adorable singing kids, and a great community feeling. Please consider bringing a donation of children’s winter clothing for Philly FIGHT. See you there! Click here to join the Facebook event. Tuesday, 12/19 (8th candle) – If you know of a great event happening on the last night of the holiday, let us know, so we can add it to the list! Otherwise, enjoy lighting all the candles at home with family or friends!